Well, I tried to warn you. Last week I said that Week 6 would be full of surprises and that the massive spreads would create some opportunities. That was exactly the case, as all four teams that were favored by 9.5 or more points - the Patriots, Falcons, Redskins and Broncos - all failed to cover the spread. Two of those teams lost outright as double-digit favorites and the end result was the first windfall weekend for the sportsbooks on this NFL season. Parity and poor quarterback play have frozen the market. There are no lines greater than a touchdown on the board this week, and seven of the 15 spreads are all at 3.0 or 3.5; token lines for relatively even matchups. Further, divisional rivalries are front-and-center this week, with the Chiefs-Raiders (Thursday night), Bengals-Steelers (CBS 4 p.m. game) and Redskins-Eagles (Monday night) all playing in the marquee nationally televised games this weekend. Add in a Super Bowl rematch between Atlanta and New England I expect one this to be one of the biggest football betting weekends of the first half of the season. 1. Kansas City Chiefs (5-1) - I think we can all agree that there isn't one top team in the NFL right now. There is no juggernaut. There is no dominating force to be reckoned with. But I will still give the Chiefs the nod because of what they have been able to accomplish and how efficient they have been to this point in the year. 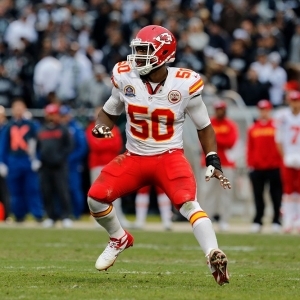 The Chiefs are 4-1 ATS against the Raiders and the road team is 21-7 ATS in that series. 2. New England Patriots (4-2) - It is somewhat ironic that after all these years Bill Belichick's defense is so bad that he has been forced to play more Cover-2. Belichick's (and Tom Brady's) ability to beat the Colts' Cover-2 is what turned them into a dynasty in the 00's. But now their reliance on it means we shouldn't trust this team to cover many of the big spreads they are destined to face. 3. Philadelphia Eagles (5-1) - Be wary: this team has won four in a row, covered three in a row, and this week they have become the Hype Team that Everyone loves right now. That means that their betting value is vanishing by the day. The Eagles are 5-2 ATS in their last seven Monday Night Football Games. 4. Pittsburgh Steelers (4-2) - Just when things started looking up for this erratic, but talented, bunch, now it comes out that Martavis Bryant wants to be traded. This locker room has to be toxic right now with all the subplots and issues floating around. The Steelers are 20-8 ATS in their last 28 games against the Bengals, including 5-2 ATS at home in this series. 5. Denver Broncos (3-2) - The Broncos front seven held Melvin Gordon (54), Ezekiel Elliott (24), LeSean McCoy (21) and Marshawn Lynch (12) to a combined 111 yards but then allowed Orleans Darkwa to beat them for 117 rushing yards. Makes sense. The road team is 11-4 ATS in the last 15 Broncos-Chargers games and Denver is 5-1 ATS in its last six road games against the Chargers. 6. Seattle Seahawks (3-2) - The Seahawks have really owned the Giants, beating them three straight times (3-0 ATS) and going 4-1 ATS in their last five trips to New York. The favorite is 5-1 ATS in the last six meetings. 7. Minnesota Vikings (4-2) - Harrison Smith is a one-man wrecking crew and is the real backbone of this dominating Vikings defense. He deserves to be called out for his outstanding game last Sunday and we'll see if he can take advantage of a struggling Ravens offense this week. The Vikings are 20-6 ATS in their last 26 home games. 8. Atlanta Falcons (3-2) - Realistically, the Falcons should be 1-5 right now. The Bears had them absolutely beat in Week 1 (were it not for Jordan Howard's drop) and the Lions definitely had the Falcons beat (were it not for a horrendous call). Is this team a paper tiger? We will find out this week when they gear up for their Super Bowl revenge game up in Foxboro. 9. Carolina Panthers (4-2) - Cam Newton did absolutely everything he could to lose that game against the Eagles. He was awful in the second half. Also, I don't expect Luke Kuechly to play this weekend because of yet another concussion. That loss is mammoth. And I think that teams are going to start taking advantage of Carolina's new blitz-happy approach, especially now that they are without their leader. 10. Washington Redskins (3-2) - These guys are tough. I don't like it that I like the Redskins because this has been a perennial irrelevant franchise with one of the worst owners in sports. Washington gets a revenge crack at Philadelphia this Monday night. The Redskins played like garbage for three quarters against the Eagles in their Week 1 matchup. But if it wasn't for a horrid Kirk Cousins INT late in that game they definitely had a chance to win despite underperforming. 11. Los Angeles Rams (4-2) - Sunday marked the third straight time that the Rams won a game despite being outgained. Considering that three of their four wins have come against the Jaguars, 49ers and Colts I would be wary about jumping on the Rams bandwagon too quickly. The Rams are off to London this week and are favored despite the majority of the action coming in on Arizona. 12. New Orleans Saints (3-2) - Sean Payton obviously attended the Kyle Shanahan School of Clock Management. It is ridiculous that Payton was still throwing the ball up 35 with five minutes left in the third quarter. The Saints seriously could've taken three knees and let the clock run on their last five drives and they would've been better off than the mess they were. It absolutely makes me question Payton's ability (as if the three straight 7-9 years weren't already enough). 13. Green Bay Packers (4-2) - I am on record as saying that without Aaron Rodgers the Packers would be a 4-12 team. It looks like now we are going to find out. They are six-point home underdogs this week. But be careful; in all sports we see teams step up and play over their heads after losing a star player. Just look at what the Giants did last week for a recent example. 14. Detroit Lions (3-3) - I really can't say enough positive things about Matt Stafford, a guy that I have been really critical of in the past. He has matured into one of the best quarterback in the game. That guy nearly led the biggest comeback in NFL history despite A) being injured, B) having nothing to work with because of injuries, and C) having no reason to even attempt a comeback. 15. Buffalo Bills (3-2) - The Bills defense is No. 1 in the NFL with a defensive yards per point of 21.8. That's a big reason they are just 1-4 against the total this year. But I sense a regression within the next month. Add in even a modest offensive improvement and the Bills could be a solid value on the 'over' over the course of their next five or six games. 16. Baltimore Ravens (3-3) - Joe Flacco looks like a 52-year old man trying to play quarterback right now. It's painful to watch. The Ravens are just 3-7 ATS in their last 10 road games. 17. Cincinnati Bengals (2-3) - Perhaps more than any other team in the NFL, I am really curious to see what the Bengals look like coming out of their bye. This team had momentum heading into the week off and were on an upswing. But they get a tough draw heading to Pittsburgh to face a Steelers team which they are just 1-7 ATS against in the last eight meetings. 18. Oakland Raiders (2-4) - The Raiders have been outgained by an average of 144 yards and outscored by nine points per game in their last four. And, unlike last year, it has mainly been because of an underachieving offense. The Raiders are just 3-11 ATS in their last 14 home games against the Chiefs and just 3-7 ATS when playing on Thursday. 19. Dallas Cowboys (2-3) - The Cowboys would've been much better off just appealing Ezekiel Elliott's suspension, working behind the scenes to get it reduced to four games, and then swallowing their medicine. Now this team is dealing with a constant distraction. The Cowboys are on a 3-9 ATS slide and they are 3-8 ATS in their last 11 conference games. 20. Arizona Cardinals (3-3) - Adrian Peterson was an absolute animal on Sunday. If he plays like that every week and gives the Cardinals offense some balance then this team might actually have the juice to make a run in the West. Arizona had thrown the ball on 71 percent of its plays in the first five weeks. But they flipped that against the Bucs, running 35 times and dropping back just 23 times. 21. Houston Texans (3-3) - The Texans have managed an incredible 9.5 offensive yards per point over their last three games. At some point the Deshaun Watson hit parade may slow down. But Houston is averaging 39 points per game in their last four games and are easily 4-0 against the total in those tilts. 22. Tennessee Titans (3-3) - This has got to be the worst tackling team in the NFL. This defense has adequate talent. They have a solid scheme. But for the past three years these guys have been the worst tackling team that I've seen on tape. 23. Jacksonville Jaguars (3-3) - The Jaguars are just 3-8 ATS in their last 11 games against teams with a losing record. They have done well in Indianapolis, though, going 7-3 ATS in their last 10 road games against the Colts. Jacksonville is 4-0 ATS the past two years against Indy. 24. Los Angeles Chargers (2-4) - The Chargers have been outscored 50-7 this year in the first quarter. But are things starting to even out for them late in games? After two full years of being caught on the wrong end of every bizarre last-minute failure the Chargers have won back-to-back games thanks to fourth-quarter comebacks. 25. Tampa Bay Buccaneers (2-3) - Take the points! Dirk Koetter becomes the latest in a long line of foolish coaches that started chasing points too early in the game, choosing to start going for two after each touchdown starting early in the third quarter. As I have said 1,000 times: you should not be going for two, with very rare exception, outside of the final seven minutes of a game. Period. 26. New York Jets (3-3) - Bill Belichick was right: these guys do play with a ton of heart. You have to wonder if they are primed for a letdown this week, though. They were sky high for their shot at the Patriots but now have to rebound on the road down in Miami this week. They've been outgained by an average of 180 yards per game in their three road contests. 27. Chicago Bears (2-4) - I think that Akeem Hicks has done enough in six games to earn a Pro Bowl trip this year. I think he's been the best interior defensive lineman that I've watched on tape this year. He has been nearly unblockable one-on-one and either makes or forces one game-changing play a game. 28. Miami Dolphins (2-3) - The Dolphins offensive line finally held its own. They were pushing the Falcons front seven around on the ground (130 rushing yards) and kept Jay Cutler from getting sacked. I still don't think Miami should've gone to Jay Cutler instead of Matt Moore. But Cutler's one benefit - his only benefit - is that he gives his team a chance in games they are otherwise completely overmatched. 29. New York Giants (1-5) - This whole season has been vintage Giants. I have said for years that this is the easiest team in the NFL to handicap. When they are expected to do well or have the least bit of hype they always flop. When they are completely written off or expected to be overmatched they always come to play. 30. San Francisco 49ers (0-6) - Another week, another close loss for the 49ers. They have now lost their last five games by a combined 13 points! They are 4-1 ATS in those games and this team is better than it seems. I think they will run out of gas by December, but in the meantime this team will keep chopping until they get that first outright win. 31. Indianapolis Colts (2-4) - The Colts are now at a minus-80 point differential in the second half, by far the worst in the league. They looked like a Pop Warner team in the second half in Nashville. Jack Doyle couldn't hold the ball, the offensive line was paper mache, and Jacoby Brissett was missing throws. The defense wasn't any better, with their discombobulated secondary continuing to get torched by big plays. Oh, and Chuck Pagano's foolish use of timeouts late in the game didn't go unnoticed either. 32. Cleveland Browns (0-6) - Jesus, these guys aren't even close. Robert Ferringo posted a profit in five of the first six weeks to start the NFL regular season and he is riding a run of five of six overall winning weeks. Robert has exploded for nearly +$4,000 in football profit over the last month alone and he has gone 13-7 for over +$2,700 with his top plays. Robert is an amazing 29-9 (76%) with his NFL totals plays and he has hit 59.3 percent of his totals plays over the past 12 years! Don't miss out on Sunday's 7-Unit NFL Play!